One month to go, sportsfans. In the Gold League, the Plainsfield Hitmen and the Diamond Gems are neck and neck at 104-36 in the battle for home field advantage in the playoffs. Both lead their respective divisions by wide margins. Meanwhile the Steel Division title remains up for grabs with the Green Bay Yoopers (78-62) holding a three-game lead over the New York Giants. The wild card race is exciting, too. Three teams are battling for two spots. The Great Kills Ghosts lead the race with a 77-63 mark. 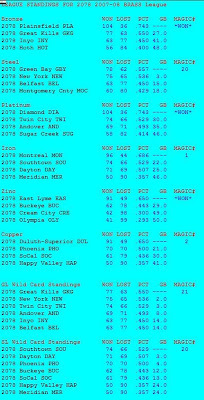 New York holds the second wild card slot with the Twin City Challengers just a game back. The Silver League divisional races were wrapped up some time ago. Montreal (96-44), East Lyme (91-49) and Duluth-Superior (91-49) are waiting to see who will join them in the playoffs. As in the Silver League, three teams are vieing for two wild card slots. The Southtown Misers (74-66) and Dayton Dragons (71-69) are the frontrunners, but the Phoenix Phoenix have a shot at 70-70. Alfonso Soriano continues his push for MVP honors in the Gold League. He is having a phenomenal season. He leads the league with 127 runs, 49 homeruns and 136 RBIs. Did I forget to mention his 53 steals? I don't know if it's been done before, but with one more homerun, he could attain the first 50-50 season in BRASS history. Meanwhile, his teammate, Chien-Ming Wang, leads the league with a 20-6 mark. The Silver League MVP race is tighter, but Travis Hafner seems to have a leg up on his rivals. Hafner is hitting .327 (2nd), has scored 102 runs (4th), has 38 doubles (7th), 45 homeruns (2nd) and leads all BRASS with 138 RBIs. Brett Myers leads the league in wins with 18 victories. Oddly enough, Jeff Francis of defending champ Cream City, which is suffering during its one-year rebuild at 42-98 mark, leads the ERA race with a 3.01 mark. I disavow any knowledge of how my Challengers are so close to a playoff spot.